When Buying From An Artist... You Aren't Buying A Thing. When buying from an artist / maker, you’re buying more than just an object / painting. You are buying hundreds of hours of failures and experimentation. You are buying days, weeks & months of pure joy. YOU AREN’T JUST BUYING A THING, you’re buying a piece of heart, part of a soul, a moment of someone’s life. 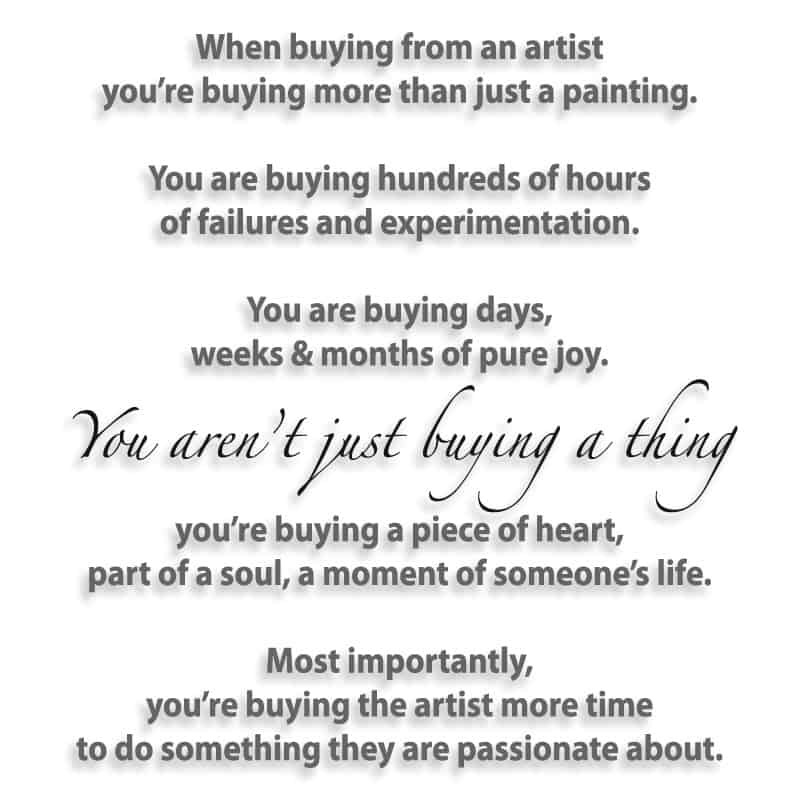 Most importantly, you’re buying the artist more time to do something they are passionate about. The above writing isn’t mine, but it’s to the point and I like that. And I’m not sure that anything else even needs to be added to it. Except that I would love to give credit where credit is due. I came across this on Facebook recently (the text anyway – not the graphic. I made that). It’s on a few pages (quite a few actually), so I don’t have any way of knowing or validating who originated it. And maybe that’s not important. Either way, if it was you, let me know and I’ll credit you. And whoever you are — thanks. Interested in knowing more about collecting art? Visit ArtBusiness.com to learn more. Or, read my Artist Blog.